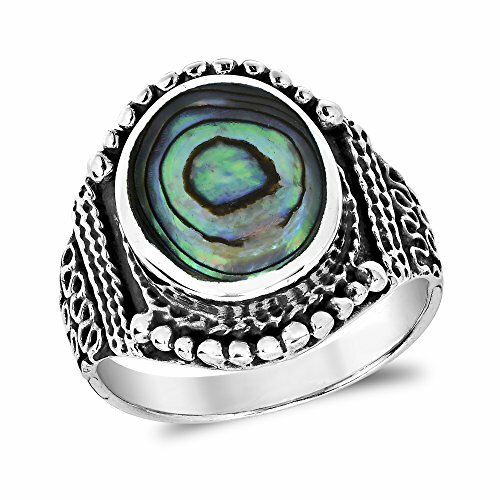 Add a classically elegant oval abalone shell ring to your style profile with this amazing piece from Thai artisan Goong. Inspired by the talented silver craftsman of Bali, this ring features designs and swirls native to that beautiful country. (This beautiful piece comes in a variety of stones and colors to choose from). 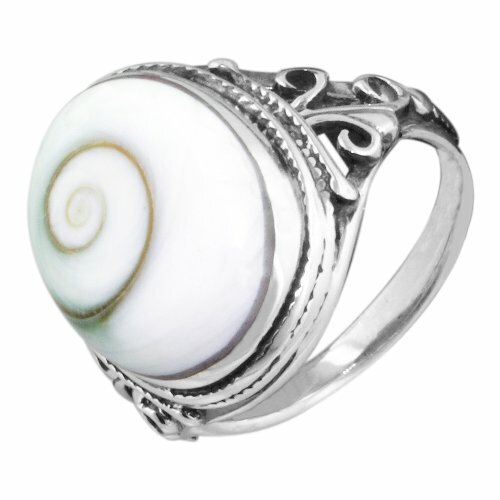 A unique, handcrafted accessory, this ring will add an exotic and tropical vibe to any outfit. PLEASE NOTE: The handcrafted nature of this product will produce minor differences in design, sizing and weight. Variations will occur from piece to piece, measurements may vary slightly. AERAVIDA works directly with gifted and talented Artisans from all over the world. At the core of our philosophy is fair trade and fostering a sustainable future for our Artisans. ARTISAN STORY: Goong worked very hard learning traditional embroidery, weaving and jewelry design. Her favorite was jewelry design because she loved how she could use native materials such as semi-precious stones and silver to create beautiful pieces. Goong worked hard honing this craft and she opened a small workshop where she could design and create silver jewelry. Goong's dream of owning her own business so she could provide for her family was finally coming true. 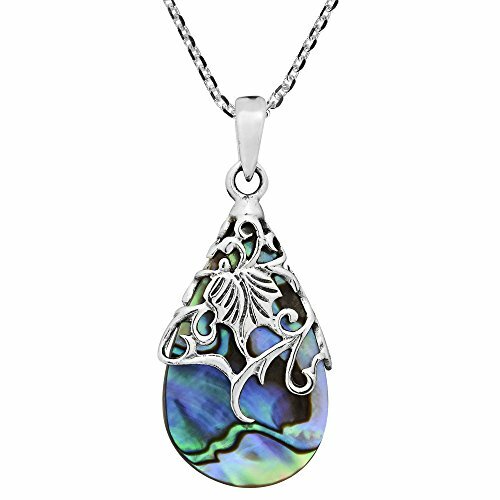 This amazing and stylish necklace features a flowing vine of .925 sterling silver that encompasses a vibrant teardrop shaped accent made from either abalone shell. This design comes in a variety of vibrant colors to match any outfit. This beautiful pendant rests on a cable chain that measures 18 inches and is finished off with a round spring ring clasp. Thai designer Goong has created a truly stylish necklace that is sure to compliment any outfit. PLEASE NOTE: The handcrafted nature of this product will produce minor differences in design, sizing and weight. Variations will occur from piece to piece, measurements may vary slightly. AERAVIDA works directly with gifted and talented Artisans from all over the world. At the core of our philosophy is fair trade and fostering a sustainable future for our Artisans. ARTISAN STORY: Goong worked very hard learning traditional embroidery, weaving and jewelry design. Her favorite was jewelry design because she loved how she could use native materials such as semi-precious stones and silver to create beautiful pieces. Goong worked hard honing this craft and she opened a small workshop where she could design and create silver jewelry. Goong's dream of owning her own business so she could provide for her family was finally coming true. 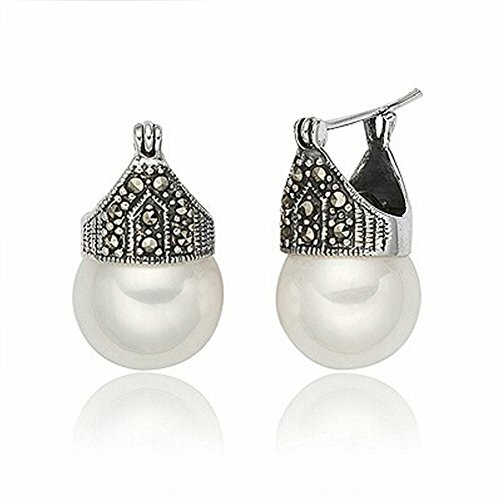 Gorgeous shell pearls earrings, with marcasite gemstones setting, retro style earrings very beautiful, made by the professional jewelry designer, with great quality and super inexpensive price. Fine earrings size 12*20mm (0.48" x 0.80"), packed a pair (2pcs) in a navy blue velvet box and gift bag, with 1pc silver maintaining cloth and greeting card. 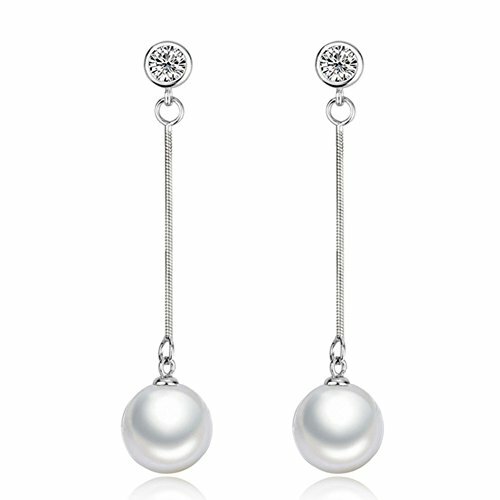 Fashion shell pearls earbobs are made by the professional jewelry designer, with great quality and super inexpensive price. The image may show slight differences in texture, color, size and shape. 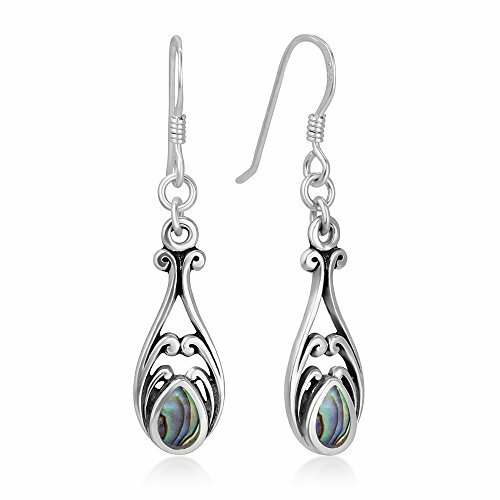 Beautiful teardrop dangle earrings are constructed with .925 sterling silver and accented with either abalone shell to create an amazing yet unique fashion accessory. This design comes in a variety of vibrant colors to match any outfit. This handmade piece comes from the mind of Thai designer Goong who has created an elegant and stylish pair of earrings that are perfect for any occasion. PLEASE NOTE: The handcrafted nature of this product will produce minor differences in design, sizing and weight. Variations will occur from piece to piece, measurements may vary slightly. AERAVIDA works directly with gifted and talented Artisans from all over the world. At the core of our philosophy is fair trade and fostering a sustainable future for our Artisans. ARTISAN STORY: Goong worked very hard learning traditional embroidery, weaving and jewelry design. Her favorite was jewelry design because she loved how she could use native materials such as semi-precious stones and silver to create beautiful pieces. Goong worked hard honing this craft and she opened a small workshop where she could design and create silver jewelry. Goong's dream of owning her own business so she could provide for her family was finally coming true. Simple, subtle. A perfect accent piece for your casual or more formal occasion. Framed round black resin stones. 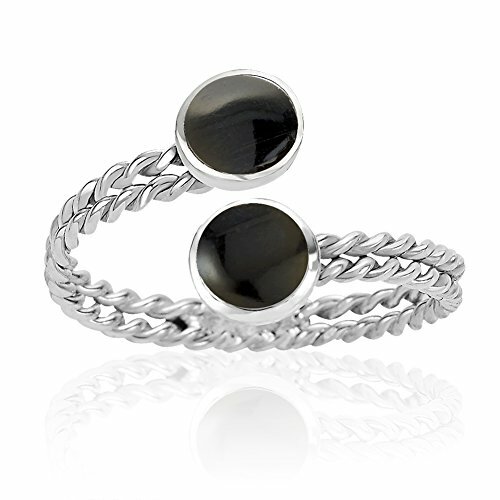 This adjustable ring, sizes 6-9, allows one to tighten or loosen the band. Velvet pouch included for storage and nice gift presentation. About Chuvora JewelryChuvora Jewelry is a Mystic Clothing brand based in Palm Coast, Florida. Despite our rapid growth, we have remained loyal to our original hallmarks: Quality and value, ease of ordering, and integrity. GemstonesWhen present, gemstones may have been treated to enhance properties such as color and durability. See listing details for treatment disclosure information. Jewelry Care While Chuvora products are designed to last, proper care is an important part of keeping your jewelry looking it's best. Be sure not to wear your jewelry while cleaning or working with harsh chemicals, in pools or spas, or while playing sports. Store your jewelry individually to keep them from scratching each other. Store sterling silver jewelry with anti-tarnish strips to keep them looking their best. To clean your jewelry, use a warm, soapy water soak and a soft brush - especially when cleaning jewelry that contains gemstones. 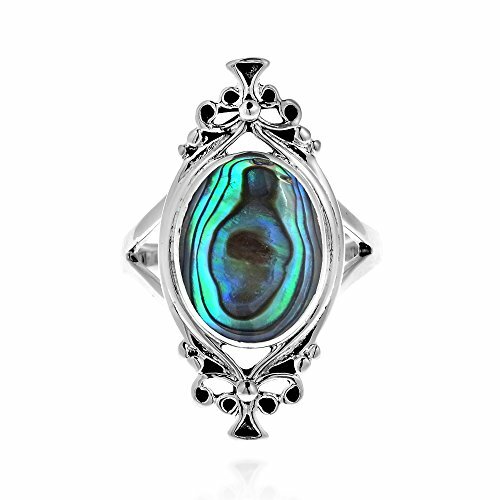 Vintage inspired, this ring features an oval shape of genuine abalone shell. Goong ornated this ring with .925 sterling silver to create a dramatic look. PLEASE NOTE: The handcrafted nature of this product will produce minor differences in design, sizing and weight. Variations will occur from piece to piece, measurements may vary slightly. AERAVIDA works directly with gifted and talented Artisans from all over the world. At the core of our philosophy is fair trade and fostering a sustainable future for our Artisans. ARTISAN STORY: Goong worked very hard learning traditional embroidery, weaving and jewelry design. Her favorite was jewelry design because she loved how she could use native materials such as semi-precious stones and silver to create beautiful pieces. Goong worked hard honing this craft and she opened a small workshop where she could design and create silver jewelry. Goong's dream of owning her own business so she could provide for her family was finally coming true. 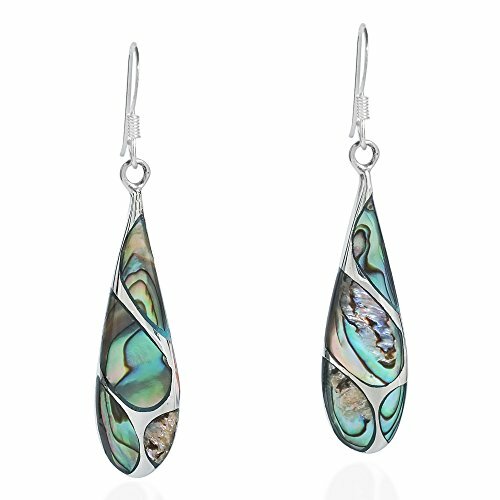 Compare prices on Vintage Sterling Silver Shell at Shopsimal.com – use promo codes and coupons for best offers and deals. We work hard to get you amazing deals and collect all avail hot offers online and represent it in one place for the customers. Now our visitors can leverage benefits of big brands and heavy discounts available for that day and for famous brands.